Last month I found myself in Ashland Oregon with the opportunity to rent a bike and wonder around the quaint southern Oregon town. I knew United Bicycle Institute was nearby and on a lark I stumbled onto the end of UBI’s first annual frame building show. Incredible work was on display from the likes of Ira Ryan, Map Bicycles, DeSalvo, Baylis, Goodtimes and more. The builders on exhibit pitched in and built a frame over the course of the day that was raffled off at the end of the show. I had a blast at the show, and I only regret not having my camera. The following day, JB of Goodtimes Bicycles was kind enough to give me a tour of his shop. 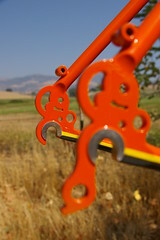 The intricate custom dropouts pictured here are indicative of the details incorporated into his work. Take a virtual shop tour, after the jump. We look forward to catching up with JB and checking out even more beautiful custom frames built in Oregon at next weekends Oregon Manifest. Next Next post: Yodelicious took a picture!